1. Various high power SMD inductors are superior to high saturation. 2. 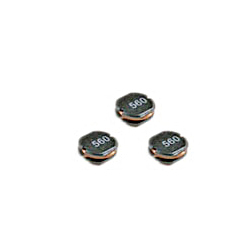 These products are low profile with low DC resistance. 3. Provided in embossed carrier tape packaging for use with automatic mounting machines. Applications: excellent for power line DC-DC conversion application used in portable telephones, personal computers, hard disk drives,and other electronic equipment. 1. Electrical characteristics: Test freq. (L): SCO73/75/104/105 => 10 ~ 82uH(2.52MHz/0.25V), 100 ~ 330uH (1KHz/0.25V). 2. Test Instrument: (1) Inductance (1KHz): HP 4284A LCR meter, or equivalent. (2) Inductance (up 1MHz): HP E4991A LCR meter, or equivalent. (3) RDC: digital milli ohm meter 16502 , or equivalent. (4) Rated D.C. current: HP4284A+42841 test fixture. 3. Tolerance of inductors: ¡ESCO104 : 10 ~ 47uH ± 20%(M) , 56 ~ 560uH ±10%(K). 4. This indicates the value of current when the inductance is 10% lower than its initial value at D.C superposition or D.C current when at rt = 40° whichever is lower. 5. Operating temperature: -20 °C to 80 °C.